Heidi Cohen wrote a great piece about the importance of curating your brand’s owned content, and why it’s as essential a part of your content strategy as curating content from third parties. 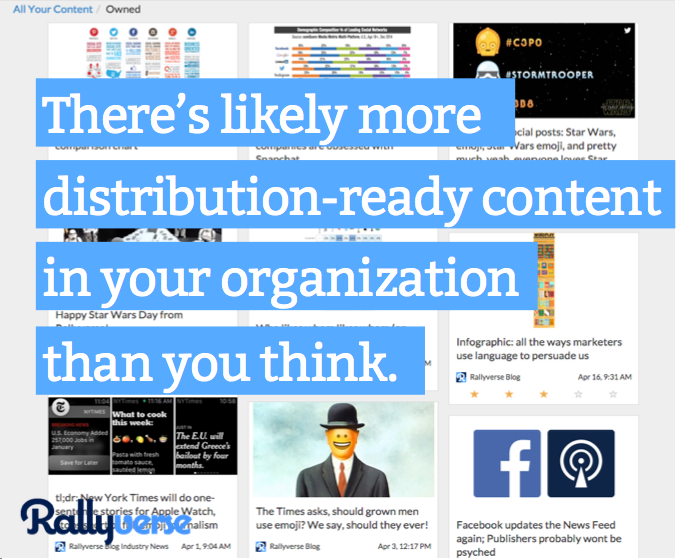 At Rallyverse, we’ve always been big proponents of maximizing the use of your owned content assets and sharing those assets in as many channels and as many formats as you can. So it was great to hear another perspective on both the why and the how of curating your existing content assets. If you mix evergreen content along with more timely content pieces on your blog or Slideshare, then you likely have a stable of ready-to-go content that addresses topics that will be relevant today, next week, even a month from now. Finding those items when they’re relevant and re-posting them means you’re getting additional value out of your assets. Next time you get hung up on worrying about whether or not you can Tweet a link to the same blog post again, remember that no one follows your Twitter as closely as you do. If content is relevant, you can share it again. And again. And again. Trust us, we did the research and you’ll be fine. In terms of how you put this all into action? Rallyverse can help. Look for details here on the blog in the next few days.